Can you imagine Real Madrid without Ramos? James Rodriguez has spoken of his desire to go back to Real Madrid once his loan deal with Bayern Munich ends. The Colombian superstar left Real Madrid with the hope of getting first-team football at the Allianz Arena. However, things didn’t pan out as expected and it has been reported that the Bavarians might not trigger the buy-out clause in the deal. Meanwhile, James himself has admitted that he has everything at Madrid but is waiting for the season to end to see what happens. He also revealed that he still has contact with some Real Madrid players. "I have to think hard about what I'm doing [in terms of my future]," he said. "In Madrid, I have everything such as my house and people who love me. “I keep in touch with some Real Madrid players." Imagining Real Madrid without Sergio Ramos is quite hard. He has been at the club for over a decade and is now its captain. However, there is one way he could leave the club this summer. 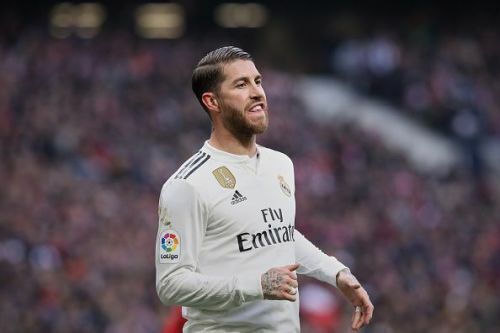 According to reports from Spain, Sergio Ramos will leave the Galacticos if Florentino Perez appoints Jose Mourinho as manager. This one comes from the folks at AS, who claim that the Galacticos have a plan to sign Eden Hazard from Chelsea. The Blancos waited until Courtois had a year left in his Chelsea contract before signing him for a bargain price. And they are going to follow the exact same path to sign Hazard, who will have just a year left in his contract in the summer of 2019. As if we didn’t know that already!